Note: the PowerMic III is manufactured in two configurations - with a 3 ft. cord or a 9 ft. cord. This product listing is for the model with the 3 ft. cord. See "related products" below for the listing on the 9 ft. model if you are a desktop user and need the extra length. The option of purchasing it with either a 3 ft. cord (laptop users) or 9 ft. cord (desktop users) - the version listed here includes the 3 ft. cord. A newly designed mini-trackpad for cursor control which replaces the former pointer stick and which can be pushed for left-click functionality. If you are new to use of a hand-held USB microphone, this is a great solution for many Dragon users and preferred by most medical providers who like to avoid the constant mounting and unmounting of a headset microphone. By virtue of the included analog to digital circuitry, this product bypasses the on-board sound card, attaches directly to an available USB port, and this greatly reduces the likelihood that speech recognition performance will be hampered by a bad on-board sound card. 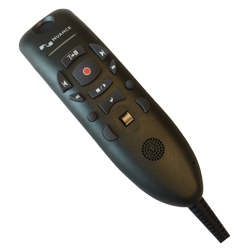 The 10 programmable buttons allow you to toggle the microphone on and off, navigate forward and backwards through navigation fields, and accomplish a variety of other functions with a quick push of a key. It includes an embedded microphone element which leads to a fairly high level of immunity from external noise. In this regard we consider it superior to every other hand-held on the market. It includes ten programmable buttons - these can be programmed directly through a dedicated tab on the Dragon Medical options tab to do a slew of helpful things. This is a major advantage of this microphone. It is the only microphone that is made with two cord lengths (3ft. or 9ft.) The cord is not easily exchangeable, but you have the option of cord length up-front when you purchase. It is well constructed and durable. It has a less than stellar warranty (only 90 days). Most other hand-helds come with a 1- or 2-year warranty. In our opinion it is not quite as ergonomic as the alternatives, including the Philips SpeechMike Premium and Grundig SonicMic3. We love the new optical track pad, but also think its placed a little low, so it's a bit of a reach for your thumb. It does not integrate with non-medical versions of Dragon (buttons are not programmable in non-medical software); with the use of Octopus USB Controller it can be used with all versions of Dragon, but this involves laying out another $69. It is compatible with a Mac only with some tweaking and use of additional software. Comments: We consider this microphone to be a significant upgrade from the PowerMic II, most notably because of the switch to a non-mechanical track pad and the availability of a shorter cord. Despite this, we don't recommend upgrading to this if you are a current PowerMic II user and happy with the performance. We have yet to do a formal head-to-head comparison with the PowerMic II in terms of performance, so we can't yet say it works any better. If you are new to speech recognition software and are considering the purchase of a hand-held microphone to use with medical versions of Dragon, this is certainly a great choice. Note for Mac Users: With a easily downloadable utility it can be made to work with an Apple Computer and Dragon Dictate or MacSpeech Dictate. With added utilities you can even use the PowerMic in a push-to-talk method. For additional information on this, please visit our Push-to-Talk Programming for the Mac page.